San Mateo CA— Christian Clifford, author of three books about Spanish-Mexican history in California, has been on a quest to visit all twenty-one California missions, on foot! When asked why he is doing it, he shared, “I am part of a group called the California Mission Walkers. We enjoy following in the footsteps of the padres. I’ve visited all 21 missions by car so now I thought it would be nice to walk the entire chain, God willing. Being a Catholic school teacher for over twenty years, my hope is to get as close to the lives of the amazing people who were the first Catholics in California—Indigenous, Spanish, mestizo—with the hope of being a better Catholic and teacher.” Clifford teaches at Serra High School in San Mateo. Next year marks its 75th anniversary. You may have noticed him walking our local byways recently. 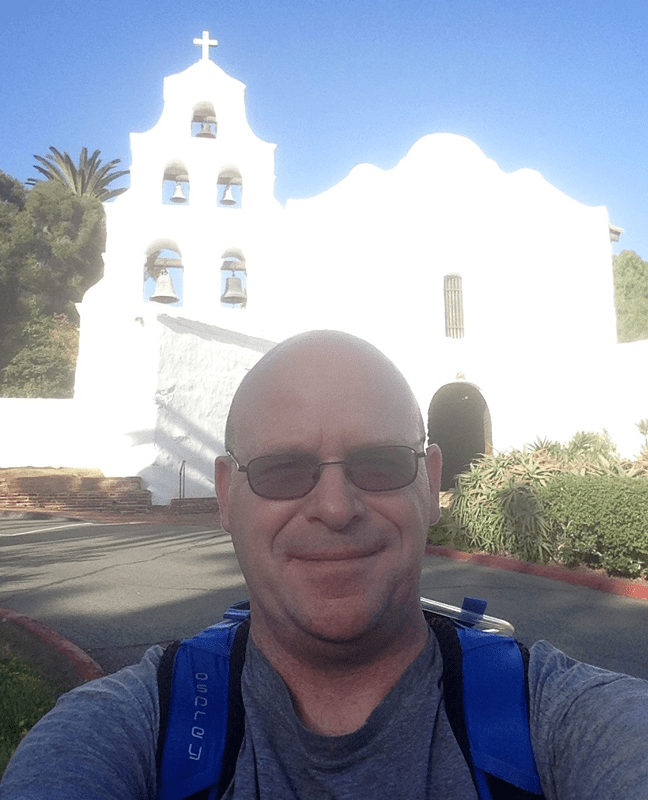 After speaking with a California History class at Point Loma Nazarene University, Clifford walked from Mission San Diego to Mission San Luis Rey. Specifics for his pilgrimage along the California Missions Trail so far are 293 miles walked over 19 days, approximately 104 hours walking, and ten missions visited. Pope Francis shared on September 23, 2015 in the homily for the Canonization Mass for Junípero Serra, “He [Serra] kept moving forward, because the Lord was waiting. He kept going, because his brothers and sisters were waiting. He kept going forward to the end of his life. Today, like him, may we be able to say: Forward! Let’s keep moving forward!” Clifford believes that with every step he takes, he walks with his Catholic ancestors who came before him—in a special way, the Indigenous, Spanish, and mestizo who peopled the California missions. For more information about Christian Clifford, visit www.Missions1769.com and The Campaign for the Preservation of Mission San Antonio de Padua Foundation at www.preservemissionsanantonio.org.